The Xperia T boasts a 13 megapixel camera with a back-illuminated Exmor R sensor and a single LED flash. It's capable of producing stills of 4128 x 3096px resolution. The camera controls on the Xperia T are available on two taskbars on either side of the viewfinder. On the left you get four shortcuts to various settings, while the still camera/camcorder toggle, the virtual shutter and a thumbnail of the last photo taken are on the right. There are three capture modes to choose from: Normal, Auto Scene recognition, and Sweep Panorama. In Normal, you pick the Scene settings manually or you can enable Scene recognition and let the Xperia T take a guess (it's fairly good at it). Sweep panorama mode lets you take a panoramic shot by sliding your camera in a line from left to right. The Xperia T features a Quick launch option, which lets you customize the phone's behavior upon a press of the camera key when the phone is locked. The default option is Launch and capture - it unlocks the phone, starts the camera and instantly snaps a photo. It's hard to frame the first shot right from this mode, but you can quickly take another photo as the camera reloads quite fast. The other option is to just unlock the phone and start the camera, or you can just disable this feature altogether. The 13 MP camera sensor on the Xperia T produced stills which were for the most part good, with the notable exception of some serious overexposure issues. For the most part, this was limited to scenarios where objects in the frame reflected direct sunlight, which resulted in loss of detail and inaccurate color reproduction. Individual channel clipping was also a prevalent issue, as in many cases the red end of the spectrum was severely blown out. To better illustrate the poor metering, we've included two sets of samples. This first series is taken at the default exposure value. This second series is taken with the exposure reduced by 2/3 of a stop. As you can see, the resulting samples feature more detail and less highlight clipping, particularly in brighter environments, which proves the camera exposure metering is flawed. Otherwise, the camera features a good dynamic range, and excellent macro capabilities. Colors come out good and there's plenty of detail available. The Xperia T might not be the be-all and end-all of smartphone cameras, but it's certainly one of the better cameraphones we've seen. Since there aren't many 13 MP camera sensors out there, we're going to compare the Xperia T to two 12 MP cameras, one belonging to the Nokia N8, the other to the T's predecessor, the Xperia S. Feel free to choose any other adversaries you wish - the tool's page will give you all the information on how to do that and what to watch out for. 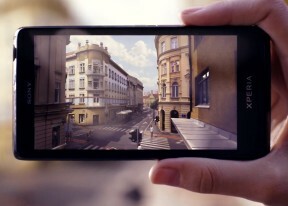 The Sony Xperia T captures 1080p video at 30 fps, currently the standard for high-end droids. The Xperia T camcorder features continuous autofocus. It may take a few seconds to refocus after you re-frame but that's better than repeatedly attempting to lock focus and ruining your video. FullHD videos are stored in MP4 format (20Mbps bitrate) and the frame is very stable at just below the 30fps mark. The Xperia T videos come with stereo sound recorded at 128Kbps bitrate and 48kHz sampling - all pointing to slightly superior video recording compared to the Xperia S.
During video recording we see the same issue as with still images - notable tendency towards overexposure. This leads to loss of detail, and since the videos shot with the Xperia T aren't that good to begin with you are left with pretty mediocre footage. Here's another video with the exposure adjusted by -0.7EV, where you don't see as much highlights clipping. Still the amount of resolved detail remains uninspiring and even though colors are decent, we wouldn't call the videos worthy of a flagship. Here's hoping that Sony does something about it with some of its next firmware updates. If you want to look closer at the video quality, you can download the samples as taken straight off the device. Here's the first video with default exposure settings, and the second video with the exposure set -0.7. We've added the Xperia T to our video comparison tool. See how it fares against the likes of the Galaxy S III and the HTC One X.